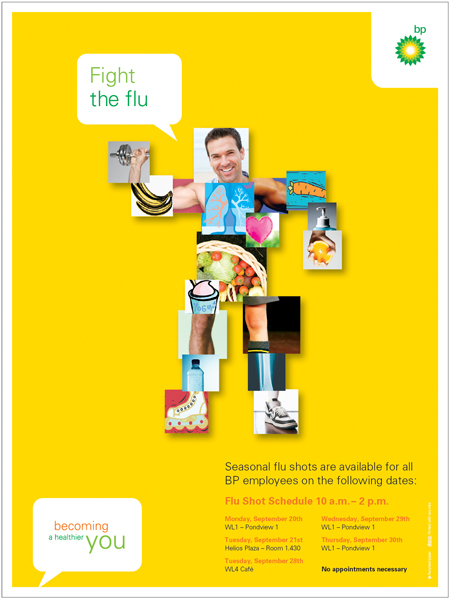 Ding, ding, ding … and in this corner … The current Wellness Program World Champion … BP’s flu fighter. BP is challenging all of their employees to become wellness champions too. Using a compilation of photo and illustrative ‘avatars’ (a campaign graphic theme) we visually communicate effective ways to fight the flu, remind employees to get a preventative flu shot, and remain healthy. This entry was posted on May 4, 2011 at 6:46 pm and is filed under Employee Communications, Events, graphic design. You can follow any responses to this entry through the RSS 2.0 feed. You can leave a response, or trackback from your own site. Brick by brick, story by story, these BP wellness elements are turning into a super-strong brand campaign all on their own. Great forward thinking as well as great design, Prismatics!